It seems an unlikely story, but the villagers of Palagolla in the Galewela area in the Matale district see their postman only once in three months. �The area is so backward they have no basic amenities like electricity, public transport , water on mains , health care, or proper road access etc.�“We have to walk at least seven to eight kilometres to get to a main road,” said L.P. Palis, a resident of the remote village.�The only government welfare the villagers receive are Samurdhi cards. “Unfortunately to collect the benefits we have to make a long trek to Galewela”, U.G. Dingiriamma said. 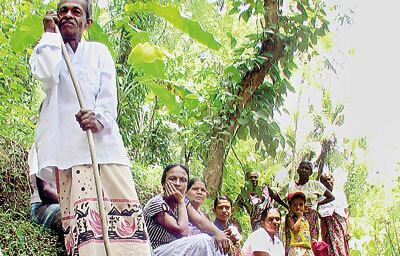 Recently the villagers returned the Samurdhi cards to the Galewela Pradeshiya Sabha, as they found it difficult to make the monthly trek to collect the benefits they are entitled to.�The only government officials villagers ever meet are the Grama Niladari and policemen. The residents have appealed to the government to construct a road so they will be able to connect more easily with the Galewela town. Bereft of public transport,Mr. Pallis and a group of villagers stop to take a rest on their 8-km trek to reach the main road.